It’s not how Jocelyn planned to fall in love. In fact, Jocelyn isn’t looking for love at all. She has a good job, and a great apartment, in a city she loves: she’s happy. But then she meets a somewhat angry stranger after mistakenly locking her bike to his. Lucas is nothing at all like any guy Jocelyn’s ever dreamed of, but she can’t get him out of her mind from the moment she meets him. Is it love? Or lust? Or could it be both together? 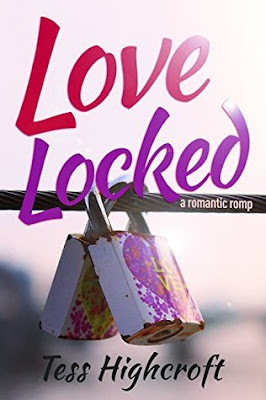 Love Locked follows Jocelyn and Lucas on a romantic romp filled with plenty of both love and lust. Jocelyn is a great character to read about with her quirky sense of humour and life, she is someone that many young people can relate to, especially with her terrible love life or lack of love life really. Unless you count her best friend who she has a friends-with-benefits agreement with, but then that is only when he is in town which isn't much anymore. When Jocelyn ties her bike and a strangers together, she comes face-to-face with a handsome guy who Jocelyn thinks she has no chance with. After the gorgeous stranger calms down and Jocelyn offers to buy him a drink, she knows that she is attracted to him but there is one small problem...his girlfriend. Although after they part, it doesn't stop Jocelyn from stopping by where the incident happened hoping to meet him again but she doesn't have much luck. Although it seems like luck is on Jocelyn's side for once and she meets her handsome stranger again though it is in a completely different place all together. The story does include some sort of cheating in a way, which I don't think is right full stop but it is told in a way that make it seem like they are soulmates. There is a lot of great parts in the novella, I love the relationship her and her best friend has and the banter that they have between them. The other thing I love is the gorgeous cover as it plays such a important part in the book which is really sweet. Love Locked with a funny romantic book that will make you laugh at the situations Jocelyn finds herself in and it will make you feel a range of emotions as you read the events that happen in Jocelyn life. Love Locked is a book that will make you see the different aspects of falling in love and the heartbreak and drama that comes with life and love.